Dory helped me understand this Proverb. Dory is the blue tang fish from “Finding Nemo,” whose short-term memory loss clenches the humor trophy for best cartoon side-kick. When Dory finally reads the address correctly, she recites the address over and over again in hopes to not forget it. Her heart was always in the right place. But, she’s Dory. It’s kind of like us reading scripture. We often stumble over odd phrases in the bible and words we can’t pronounce. Sometimes, it’s confusing. Sometimes like Dory, we’re spiritually “in the dark” and it just makes life harder. Sometimes, we say a verse over and over because we fear forgetting it. Sometimes, we fear remembering it wrong. Or… we get distracted by something shiny. Whatever the reason, we forget things. Dory taught me: it’s okay if we forget sometimes. Just like Dory, it’s inside of us! Hat’s off to sunday school teachers everywhere, who come up with creative ways to make Biblical truths sink into children’s minds and hearts. It’s good to do things to help you remember. It’s a great discipline, really. However, it’s okay if you aren’t perfect and forget sometimes. My parents, in their wisdom, wanted the truth of God to be planted in my heart even before I could understand it. The good Lord knows I don’t remember most of the bible school lessons I’ve sat through. The cool part is the Holy Spirit does this miraculous thing where He waters planted seeds. Then, those seeds grow and produce fruit in the seasons of our lives which need it most. Even now as an adult, I can see the fruit of planting seeds of truth into my own heart. I’m quite like Dory in the short-term memory loss area of scripture. I may not retain details in my short-term memory, but they are planted deep within my heart. “P. 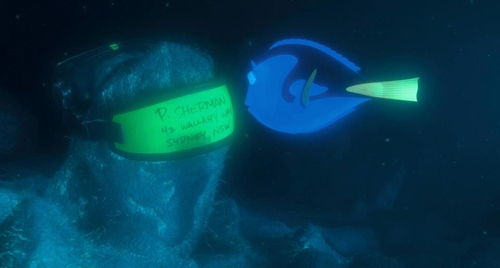 Sherman 42 wallaby way, Sydney” is the key to Marlin finding his son. The moment Dory remembers it, it’s like the sun has risen again and they can now find their way. God will use “forgotten” truth as a key to bring freedom to one of our friends, or even to ourselves. If the Holy Spirit lives inside of us, then the truth is always within us. This should bring such peace! We don’t have to fear being a failure. We don’t have to fear messing up or getting things wrong. There have been times in my life the Holy Spirit has brought up the perfect bit of truth to share with a friend in their time of need, things I could have never remembered on my own.